I’ve met and tasted with Californian winemaker Paul Hobbs (right) a few times over the past decade or so, and have also had the chance to visit his winery and vineyards in Sonoma and to visit his operation in Argentina called Viña Cobos. But when Paul paid a flying visit to Scotland in May 2014 it was a great opportunity not only to taste the latest vintages from these established wineries, but to be the first journalist in the UK to taste the wine of his newest project: a joint venture in the homeland of the Malbec grape, the Cahors region of France. Paul looked as fresh, neat and well-groomed as always when we met in his hotel for a tasting through several of his current releases. It immediately made me think of his vineyards back in California and Mendoza in Argentina, which I would describe as… well, fresh, neat and well-groomed. It’s true that the entire Paul Hobbs operation seems to be very exact, very precise, with enormous attention to detail. But in many ways that is only one side of Paul Hobbs the man, and the business. Paul is one of 11 children who grew up on their parents’ farm in upstate New York. His childhood sounds idyllic, playing baseball in sun-dappled fields or inside the family barn (after which his ‘Crossbarn’ range is named), and that connection with the earth extends into his otherwise highly technical winemaking today. “It must be 15 years since I last used a refractometer,” he tells me (the instrument that the vast majority of winemakers use to check the sugar level, and thereby ripeness, of their grapes). “I do everything by taste, just trying the fruit to see if it tastes right.” Though he does not farm organically, he does start all ferments with indigenous yeasts, farms sustainably and does not fine or filter his wines. All of that carries echoes that go back to his childhood background, and respect for ‘terroir’. 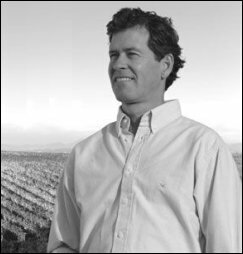 Having worked for Mondavi and Simi wineries, Paul established Paul Hobbs Wines in California in 1991, with his Argentinean outpost following in 1998. 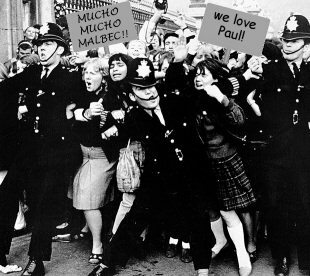 Paul remains deeply connected to Argentina, where he has consulted for numerous wineries over two decades. He is one of the instrumental figures in the quality improvement of the industry there and has acquired semi-legendary status – I imagine him being mobbed in the streets of Mendoza, 1960s Beatlemania style. But his most recent project – a joint-venture with Georges Vigoroux of Cahors – is potentially just as significant. It’s the first real, practical fusion of Argentina and Cahors in search of great Malbec. Sauvignon Blanc is almost unique in having two ‘centres of excellence’ that are widely acknowledged as absolute models for contrasting expressions of the variety: France’s Loire Valley and New Zealand’s Marlborough region. But Malbec can stake a claim for a similar phenomenon: its spiritual home is Cahors, deep in the South West of France, famed for rugged, sometimes impenetrable reds, whilst more recently, Mendoza in Argentina has emerged with a silkier, sweeter model. Paul has partnered with Bertrand Vigouroux, from the family behind the Cahors estates of Château de Haute-Serre and Château de Mercuès, to create a new trans-Atlantic wine brand called Crocus (so named because the area is also famous for producing Saffron, which comes from crocus flowers). Paul and the team at Vigouroux work together to create wines from the pick of the Cahors vineyards. “When I first got involved I wasn’t quite ready to put my name to the project,” Paul confesses. “I found so much needed to be modernised and changed that I spent 2009 and 2010 as a consultant instead, making improvements in the vineyards and winery to enable the project.” He cites a visit one August, when a long summer drought had brought one vineyard to the edge of disaster: “The vines were losing their leaves and really, really suffering,” he tells me. He insisted that they apply for permission to irrigate, and soon a couple of water tankers were in place to hydrate the vines before things went too far. On a return visit he was presented with two sample wines, the first made from that emergency-irrigated vineyard, the second from an adjoining plot that had been left to struggle on. Paul says the superiority of the irrigated example was clear for all to see. Paul visits Cahors at least twice per year, in May and November, but cannot be there at harvest as it coincides with his own Californian operation. Instead, the French winemaking team has travelled to California and Argentina to study and take home various techniques and processes. UK importer of all of Paul Hobbs’ wines is Alliance Wines. See all stockists on wine-searcher. Crossbarns is not a second wine as such, but an entirely separate label with its own winery (based in an old apple barn). “It’s its own entity with its own winemaking staff,” says Paul. It uses “Hand-me-down oak from the Paul Hobbs programme,” with very little new oak. There’s a small percentage of whole bunches with stems in the fermentation and maceration. Very good, deep colour, with an intense cherry aroma and incense-like notes of spices and Sandalwood. The palate has just deliciously focused fruit. There is also spice, a touch of briar and rhubarb/sappiness, and delicate floral notes amongst the power of the tannin and alcohol firmness. Lovely length with deep layers of flavour and texture. 91/100. £34.99 The Vineking, Penicuik Wines. See all stockists on wine-searcher. “A great vintage as was 2013: stellar, in both Sonoma and Napa,” says Paul. Made with indigenous yeast and full malolactic, fruit is hand-harvested at night and the wine is matured in all French oak, 45% of which is new. Lovely honey and nutty qualities, more almond and creamy oatmeal than toast, with delicious freshness and juiciness. The fruit comes from the Hyde vineyard, and has lots of really juicy lime freshness – lime and orange. Nice mouthfeel and texture too in a nicely balanced and savoury Chardonnay with 14.2% alcohol. 92/100. £40.99 The Vineyard, The Vineking. See all stockists on wine-searcher. There is a touch of Sonoma Coast fruit here too – up to 15% for a Pinot made in small, wide open top fermenters, all hand punched. All fruit picked at night again and this has a higher percentage of whole clusters, than the Crossbarn, as well as around 45% new oak. Meatier, deeper, more towards the mellow autumnal notes, more towards pure plum and chocolate, but also a subtle underpinning of truffle. The alcohol is 14.5%, but it does not show too much, with little notes of fragrant, ashy quality, a touch of cedar, a touch more grippy in the tannin structure too. Power and concentration, but not too much as it retains balance. 92/100. £46.90 Imbibros, The Vineking. See all stockists on wine-searcher. I had not tasted Paul’s top wine from the Napa Valley since the 2005 vintage, which was not a great one. And 2009? “It’s the year when the tail end of a typhoon swept through the vineyards just at harvest time. It left in its wake a lot of humidity, and you could see grapes turning to “fuzz” in front of your eyes. We had to hand-pick everything because the tractors could not get into the vineyards, but we brought in some really nice fruit.” 100% Cabernet Sauvignon, the nose is so complex, so cedary and tobacco-touched, with a tiny note of green olive and graphite over very refined black fruit – hinting at blueberry and damson blackness. The palate displays such beautiful graphite, edgy, superbly poised black fruit. There’s a light resinous quality, but it is really just concentration of sheer and smooth tannins and fruit. There really is copious sweet fruit, but always edged with that sheerness and grip. Lovely balance, the final impression is all about sweet, ripe, rounded and supple black fruit. 95/100. £164.88 Fine & Rare Wines, The Vineking. See all stockists on wine-searcher. 14.8% alcohol and coming to the UK market very soon (rumour has it, possibly to Majestic), Cocodrillo has been a smash hit brand in the USA for Cobos. At one time they dropped the brand, amalgamating it with the Felino brand, but consumer pressure has made them bring it back. “It’s now a slightly higher level than the Felino line,” says Paul. All oak aged mostly in second or third use barrels, with a small portion of new barrels, both American and French. Most fruit comes from the Marchiori vineyard, but also a new project vineyard north of Gualtallary. Lovely freshness and brightness, a really floral aspect to this, love the creaminess and violet with delicious smoothness and very attractive soft tannins, soft mouthfeel, but a real buoyancy of sweet fruit. Rich. 90-91/100. The wine is not currently in the UK, but will be available soon at around £19.99. See all stockists on wine-searcher. A brilliant vintage in Mendoza according to Paul, this comes from 17-year-old vineyards, planted with two Cabernet clones and sited at over 1000 metres. This is the stony vineyard ground of Pedregal. It has deliciously buoyant fruit. A lovely lift of spice and plenty of keen black fruit, dark and blackcurranty with lots of edge and peppery spice. Lots of grip, lots of tannin and tightly focused too, with a huge, long finish showing copious black fruit and spices. So many layers of fruit, spice, texture and grip. 93/100. £46.90 The Vineking. See all stockists on wine-searcher. Rebon is a vineyard in La Consulta in the Uco Valley, a cooler site at 1150 metres with 30-year-old vineyards. Paul says that the Marchiori site is a little warmer, but also older with 55-year-old vines – both planted on their own roots and both flood irrigated. Delicious lift and vibrancy to both the purple colour and the aromatics. Such exquisite fruit, all finesse and sweetness, a hugely pure redcurrant-flecked, dry, cocoa-dusted cherry, but has grip and a touch of alcoholic weight. Really very good balance and elegance, even despite the very high alcohol declared on the label at 15.5%. The grapes reach full maturity and full ripeness according to Paul, and whilst he believes a wine is all about ultimate balance, he is very much aware of the issues around high alcohols. 92/100. £44.91 Yorkshire Vintners, Lockett Bros. See all stockists on wine-searcher. This vineyard in Pedregal, Lujan de Cuyo gives such beautiful fruit, and this has a tiny herbal and floral lift. The palate has really fine red fruits and a certain creaminess and has very fine raciness and red fruit character, It is very dry, really structured, but has the gravelly, grippy, refined character that is lovely. With a touch of tomato fruitiness and a touch of briar and really nice length and balance into the finish. Gravelly, like a really good right bank Bordeaux in some ways. 15% alcohol. 93/100. £58.35 The Vineking, Define Food & Wine. See all stockists on wine-searcher. Fruit comes from Vigoroux’s own vineyards in Châteaux de Haute-Serre and Mercuès, the vines between 27 and 35 years of age. Haute-Serre sits on a plateau above the Lot Valley floor, with plentiful sun exposure. It has a rock-strewn surface with two feet of red clay and iron concretions over limestone and patches of blue clay. Mercuès is on the third terrace of the Lot, with sandy-clay soils which are poor and have excellent drainage. Lovely colour, very dense and flowing, bright violet/crimson. Very fine nose after 18 months in 50% new, 50% one-year old French oak barrels. Really nice aromatics, creamy and rounded but there’s a herbal spice and leafiness, a touch of floral. On the palate the tannins are grippier and tighter than the Argentinean tannins, but it has a savoury, earthy character as well as the very sweet and ripe fruit. Delicious hints of violet and tight kirsch flavours, the purity of the fruit is excellent and it still has structure and acidity at its core. 90-91/100. £34.99 launching May 2014, and Paul says that an higher tier wines is also in the pipeline for future release. See all stockists on wine-searcher.